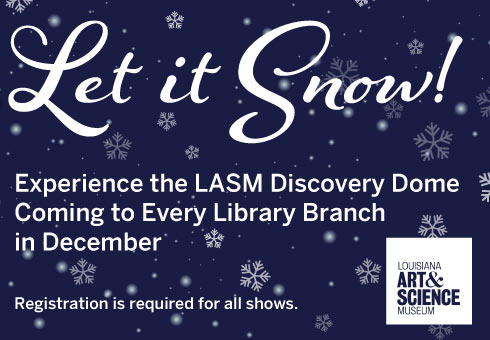 The Louisiana Art & Science Museum’s (LASM) Discover Dome is coming to all library branches again this year for a special free presentation for children of all ages! Be prepared to be amazed at Let It Snow!, a show that features a variety of festive classics like tunes by Frank Sinatra, Chuck Berry, Burl Ives and Brenda Lee. This family friendly soundtrack is visually enhanced with full dome animation, laser imagery and special effects in the audio/visual setting of the Discovery Dome. Attendees also will enjoy a stunning multi-media finale by the Trans-Siberian Orchestra. Each branch will host four 30-minute shows.